Peter Brennan formerly from Milltown and now Doughuisce, Galway displays the medals awarded to his cousin Pat by King George VI of England. 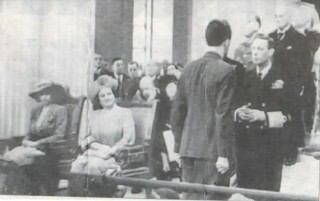 ROYAL HONOUR : Patrick Brennan receives his Military Medal from King George VI. On the left are Queen Elizabeth( later the Queen Mother) and the then Princess Elizabeth. 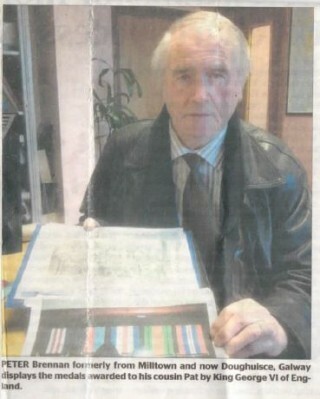 War Of Independence veteran Peter Brennan in uniform. SAFE HOUSE : The Brennan homestead at Liskeavy, Milltown, was shot up by Crown forces during the War of Independence. 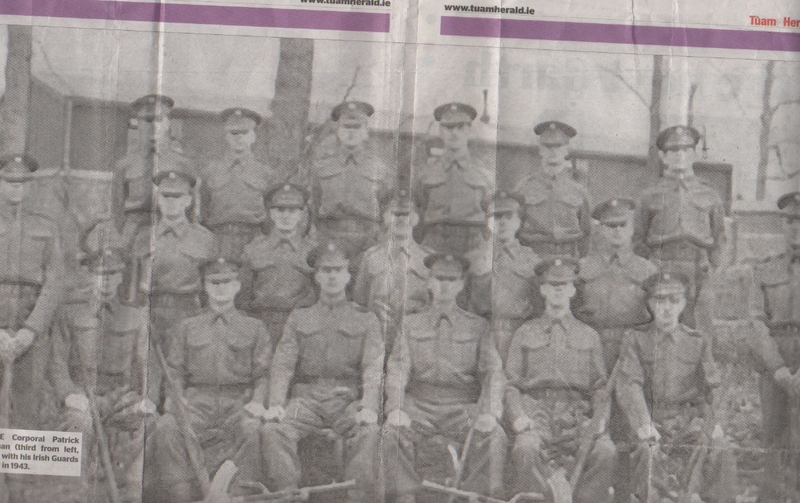 LANCE Corporal Patrick Brennan ( third from left, front) with his Irish Guards squard in 1943. As historians research the history of a century ago, a Milltown family can lay claim to heroes of two wars. The Brennan family, originally from Liskeavy, had sons honoured by both the Irish Government and British Royal family in two very different conflicts, the Irish War of Independence and Word War II. In 1945 Pat (Patrick) Brennan was awarded one of Britain’s highest honours for bravery, the Military Medal, by King George VI for his darling deeds on the battlefield. Meanwhile in 1948 his cousin Peter J Brennan, a grandfather of John Concannon of JFC Plastics, was laid to rest with full military honours in Kilconly. Deputy Mark Killilea (Snr), gave a graveside oration about his bravery in Ireland’s War of Independence. 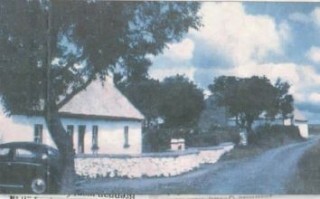 While Liskeavy was the original home of the Brennans, War of Independence veteran Peter moved from there to Ironpool, Kilconly. His first cousin, John Brennan, moved to Kilgevrin and later to Northern Ireland, home of his wife Marie. Their son Patrick joined one of the British Army’s premier regiments, the Irish Guards. 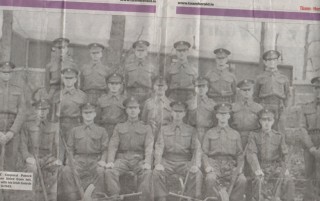 As a lance corporal in charge of a squad of 17 guardsmen, he saw service in Europe after D-Day in 1944-45, as well as on garrison and defence duty in the UK in the earlier years of the war. Patrick Brennan’s moment of glory was near Beaulieu, France in August 1944. His unit was part of a bren gun carrier force which was being harassed by an enemy machine gun nest. His subsequent action is detailed in the citation still proudly held by his cousin Peter (Pete) Brennan from Liskeavy who now lives in Doughuisce, Galway. The citation states that “L/Cpl Brennan went forward alone of his own accord with a bren gun to eliminate this nest. He succeeds in silencing the enemy machine gun but was himself wounded in the leg in the process. “In spite of his wound, however, he crawled under constant fire from other enemy weapons to a slit trench and lay there for 45 minutes. This is a graphic description of the dangers that those taking part in that war on Europe’s battlefields faced, and the extent of their bravery under fire. Peter was given some of the material about his cousin Patrick from the latter’s son in England, Gerry Brennan, who was a dental surgeon in Robin Hood Bay, Yorkshire. Gerry kept in touch with him until he passed away in 2014. Peter’s own son, Graham, also did some research on it in Dublin. His British war medals included the Military Medal (George VI) for a non-commissioned solider, equivalent to the Military Cross reserved for officers. The second medal was the 1939-1945 Star for overseas service greater than 160 days. The third was the France and Germany Star for service in France, Belgium, Luxembourg, the Netherlands and / or Germany. Medal number four was the Defence Medal for protecting home bases in the uk and the final medal was the War Medal which is the World War II medal for service. “Johnnie (John) who moved from Kilgevrin was the father of while my father, also Patrick, from Liskeavy was a brother of the Irish war hero Pete (Peter). They were first cousins of Johnnie. “My uncle Pete, who later moved to live in Ironpool, Kilconly was an engineer with the IRA during the War of Independence and later during the Irish Civil War he was captured and sentenced to death twice. “That was once in Caherlistrane and the second time when he was being held in Corrandrum. Straws were drawn to decide which six prisoners the Free Staters would shoot in Tuam Workhouse,” says Peter. “Having survived all that, my father went on to put his engineering skills to good use when he worked in Tuam Sugar Factory from the 1930s. Our home’ during the Irish War of Independence and was shot up at one stage by the British troops here. “My father, Patrick, was also beaten up by the Black and Tans close to the railway line near the Blue Pig Pub in Milltown-but he never talked ABOUT IT,” says Peter. Another aunt, Mary Ann, carried dispatches for the IRA. “Gabrielle, wife of my cousin the late Gerry Brennan in Yorkshire, tells me that there is a page of information on Pat’s deeds in World War II in the book A History of The Irish Guards. 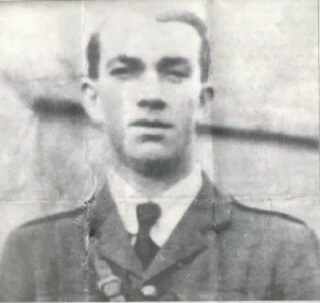 Meanwhile information about my uncle Peter’s exploits in the Irish War of Independence is currently being put together for the Kilconly commemoration of the 1916 Rising on April 24,” concluded Peter Brennan. This page was added on 21/04/2016.